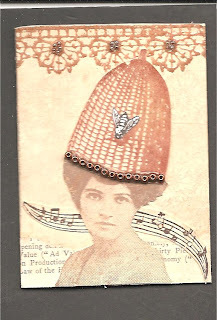 My Bee in Her Bonnet atc isn't wonky - honest - its the background! I'm fed up with doing hand to hand combat with my scanner which shifts everything each time I close the lid so I'm afraid I'll have to ask you all to close one eye and squint to see her in her full glory. My lady with a hive on her head was made using my favourite sepia tones on a honey coloured acrylic background but I'm not sure it shows up very well in the photo. Such a simple idea for an atc - not so the execution. I found her very fiddly to put together and had lots of abortive attempts but, I obviously enjoyed the fiddle because I like her so much that I want to make several more now. The whole idea of using non-milinery items as headwear really appeals to me. Fab ATC. I love the wit you put into your artwork! Sepia tones are my joint favourites too alongside greens. This is really unique and beautiful. Oh it's lovely - loving the bee-hive hat! Genius - I'm still fighting with KP Nut tins but almost finished the first one - woo hoo! Oh...I just love her...even wonky LOL! This is so funny. I always wonder where the sayings come from. And Wonky is just fine. ooooh this is totally lovely and such a fabulously creative idea!! I love your sense of humor, along with your ATC! superb ! I love these colours too. I don't even have a scanner ! your atc is hot! love her!